Dan Meyer has this one all wrapped up and explained on his blog. Why don’t you head over there? 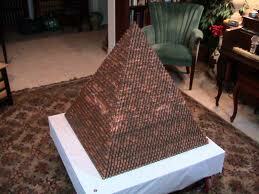 Students determine how many pennies are in the pyramid shown in the video. This one makes a nice introduction to sequences and series in Math 20-1. Most students I have tried this one with approach it and solve it by brute force. I use that opportunity to ask them whether a formula might have made this a little easier. We move into sequences and series at that point. As a really interesting aside, I had one group of students get very close to the answer using measurement. They calculated the number of pennies needed if this were a cube, used what they knew about the volume of a pyramid, and divided by 3. Because of them, I’ve also tagged this for Math 10C and Math 20-3 as a measurement problem solving activity.